How did they become Smart Ajumma? 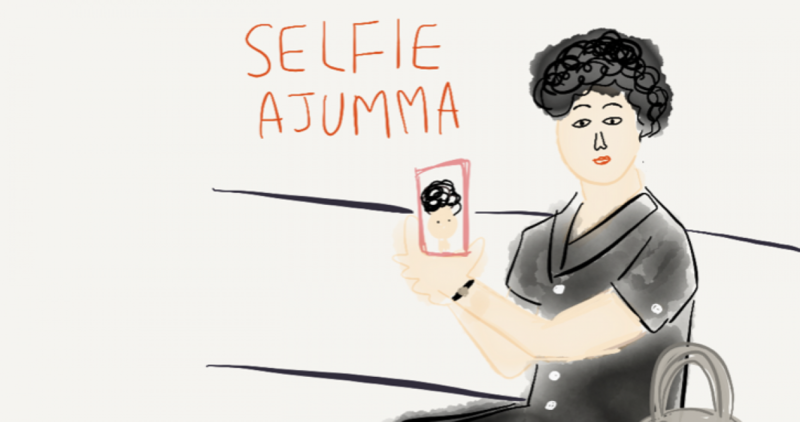 Ajummas are now becoming smarter, especially in the way of they communicate due to their use of new technology in their everyday practices such as smartphones. They are now smart ajummas and becoming smarter constantly according to the development of new technologies. However, it ought not be concluded that smart ajummas are named so only because they use new technology. They also actively attempted to acquaint themselves with new technology in daily lives. Anyway, smartphone is a pervasive mobile communicative devicenow. People use smartphones in their everyday practices regardless age and gender. Ajummas are no exception. There are exact data about penetration rate of smartphone users of middle-aged women in Korea yet, it can be assumed there are increase of using Internet among middle-aged women. I know this is not a thesis but I think if I put an actual ‘data’ in this post, it might be powerful to support my idea why I can call ajummas as smart ajummas. I can’t just assume ajummas in Korea became smart ajummas because they use smartphones a lot. So I attached these data which help you to understand my argument (or thought) how I can call ajummas as smart ajumma. For next post, I will explain in detail why ajummas should be considered as ‘smart ajummas’ today in Korea. Posted on 21 Jan 2016 22 Jan 2016 by moon ajummaPosted in Smart Ajumma (English)Tagged ajumma, Internet in Korea, 아줌마, Korea, Korean ajumma, Mobile communication, Penetration of smartphones in Korea, smart ajumma, smartphone. Next Next post: 아줌마들이 스마트아줌마가 된 이유는?